Invasive range According to the US Geological Survey, the first report of Channa argus in the United States came from Silverwood Lake, California, in 1997. Since then, it has been reported in Florida, Illinois, Massachusetts, and North Carolina (where it has been caught by anglers). 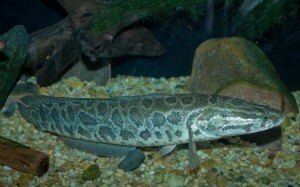 The snakehead has become established in Virginia, Maryland, Pennsylvania, New York, and Arkansas. Habitat Slow-moving streams, swamps, vegetated ponds, and wetlands. Survives in water temperatures from 32ºF to 86ºF, including waters covered in ice. 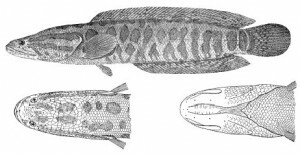 Description Cylindrical fish, with a snakelike head and large mouth with sharp teeth. The tail is truncated. Adults are golden tan to pale brown or olive in color, snakeheads are easily identified by dark irregular blotches along the sides, and saddlelike blotches along the back. The coloration of juveniles is similar to adults. Impacts Snakeheads are ambush predators. In the Potomac, ninety-seven percent of their diet is made up of fish. They are likely to compete with native fish species through predation and competition for food and habitat in ponds, streams, canals, reservoirs, lakes, and rivers. His sister was ailing, and the man in Maryland remembered that, back home in Hong Kong, there was a fish that was considered a delicacy and a restorative. He would make a fish soup for her. He called an Asian fish market in New York and ordered a couple of northern snakeheads, live. But by the time they arrived, she was well again. He put the fish––also sold as pets––in an aquarium, and started feeding them goldfish. The snakeheads started to grow. Soon they were devouring a dozen goldfish a day. What to do? Behind a local shopping center was a tree-lined, four-acre pond. An ideal new home? The snakeheads, which turned out to be a mating pair, seem to have found it so. Two years after they were released there, a fisherman caught a fish he couldn’t identify in that pond and let it go, but not before he took its photo. He showed the picture to the state Department of Natural Resources in Annapolis. They weren’t concerned until a second one was caught in the same spot, and some babies netted. All it would take was one heavy rain to wash some of these fish into a nearby river and from there into Chesapeake Bay. For this is an invader with a vengeance: a top-tier predator with a voracious appetite. A fish that can live out of water for days, cross mud to find new territory, and eat not just fish but frogs, birds, and small mammals. The drastic solution chosen was the piscicide rotenone. The kill revealed over a thousand snakeheads, many recently hatched. 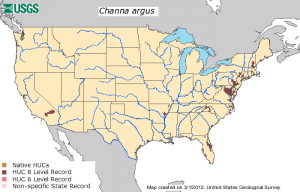 Channa argus range in the U.S. Credit: USGS. That took care of that particular pond. But despite federal legislation banning the import and transport of all snakeheads, they continue to be found in waterways around the country, the result of illegal introductions by humans. A population of the fish is now so well established in the Potomac Basin that the first Snakehead Tournament was held in 2011. All of the fish analyzed from this system had the same DNA sequence, indicating that the entire population may be the offspring of a single female. Essential to stopping the spread of the snakehead will be effective law enforcement to stop supply routes, sources, and markets to prevent new introductions. Border surveillance is essential—the Lacey Act profits bringing live snakeheads into the US. In areas where the snakehead is found, there have been some efforts to start a commercial fishery for the species around DC and Maryland, but why buy what you can catch yourself? Some hunters use a bow and arrow, but bass fishing outfits will work just as well for snakeheads. You can find some tips here. 1976 Northern snakehead imported for the Asian food market and for the pet industry in the US, found in the wild in Maine. 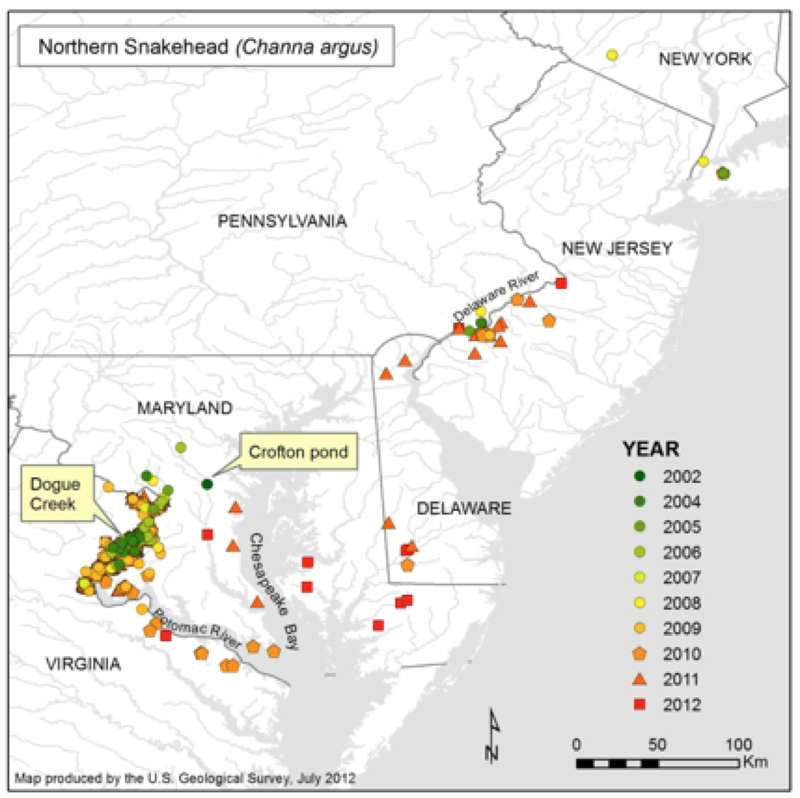 Locations of northern snakehead collections and observations in the Mid-Atlantic. Crofton Pond in Maryland was the first documented location in the region. Dogue Creek in Virginia is believed to be the point of introduction of the Potomac River population. 1997 Found in Silverwood Lake, California. 2000 Two fish captured in the St. Johns River, Florida. 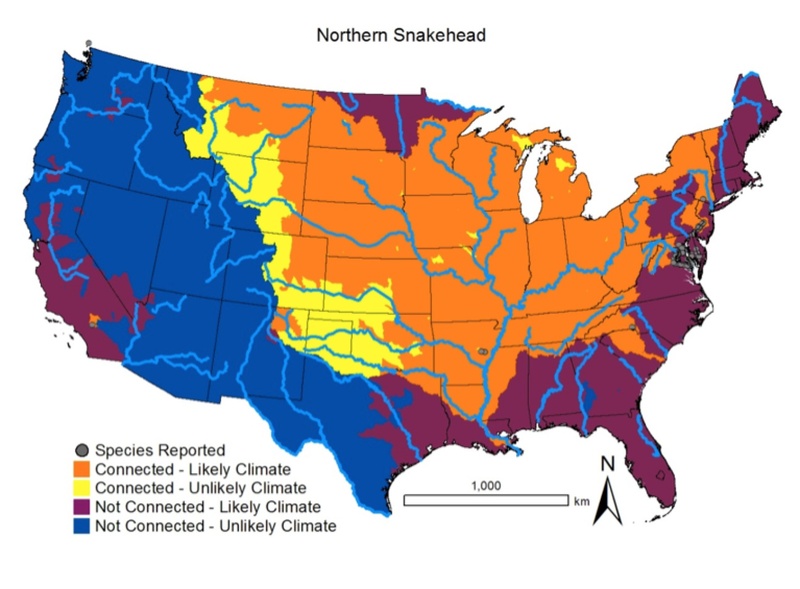 2002 Snakeheads established in the Potomac River Basin. Two fish caught in Lake Wylie, North Carolina. A subspecies native to China and Korea ––introduced by a man who never made the fish soup for which he had purchased a live pair of the top-tier predators––is discovered in a Crofton, Maryland, pond. The piscicide rotenone is applied to clear the pond. 2004 Several fish captured in Meadow Lake in Philadelphia; sampling efforts the following year resulted in the capture of several size-classes of snakehead, including juveniles. A specimen collected in Burnham Harbor, Lake Michigan (downtown Chicago), and Rhode Island. 2005 Found in two park ponds in Queens, New York. A small population has become established. 2007 Large adult fish caught in South Fork Catawba River, North Carolina. 2008 Found in a ditch near Monroe, Arkansas; species is established. Potential range expansion of the northern snakehead. Orange areas have favorable climate and are connected to established populations. Purple areas have favorable climate but are not connected to established populations. Source: Snakehead Plan Development Committee. Snakehead chimichurri photo courtesy of Astrid Riecken/The Washington Post. 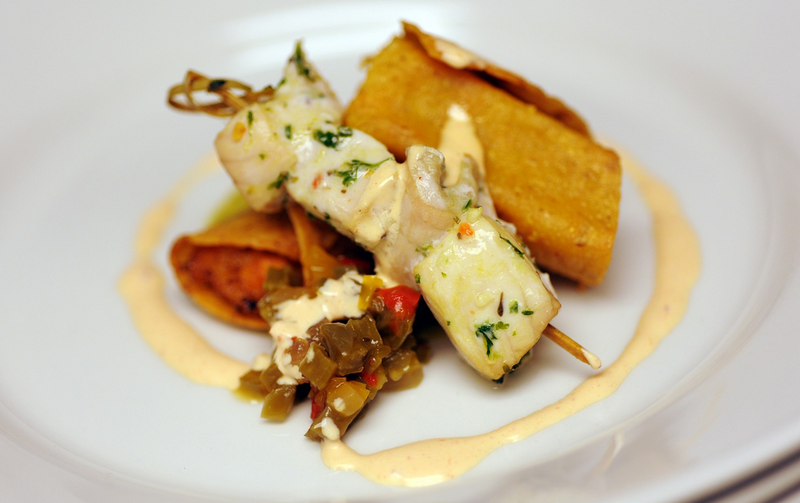 Chef Chad Wells of the Alewife Tavern in Baltimore prepared an all-snakehead dinner in October 2011. Read more about it here. Mix first nine ingredients in a small bowl. Cut snakehead into four pieces. Towel off excess moisture, and coat each piece generously with seasoning. Sautee over high heat for three minutes. If not cooked fully, bake at 400 degrees for 3–5 minutes, depending on thickness. In a separate bowl, stir cream of coconut until smooth. Add six tbs of cream of coconut to pineapple-cilantro mixture. Add diced habanero if desired. Plate fish atop salsa and garnish with roasted red peppers, strawberries, and avocado. Can snakeheads be eaten out of existence? We haven’t tried this recipe yet, but the pictures and spices look amazing. Helpful preparation tips. Snakehead Hot-and-sour Soup This plate looks wonderful, but maybe best for experienced Thai cooks, as the directions are a bit cryptic. I am happy to report that I just bought locally caught snakehead at our fishmonger in Southern Maryland. There is a push to try to get it accepted as good eats but I can’t say I loved it. It may just be the way I chose to prepare it and not the fish itself. I’m willing to try again, especially knowing that I’m 1) eating an invasive and 2) supporting local business. I’m having a hard time, in finding a site that sells Northern Snakeheads Fillets. If we eat them, out of existence, won’t that serve to limit…if not wipe out, their population? I have tried. But cannot easily find such a site.